A cat. Vladimir Putin. A controversial Crimean bridge. Who won? 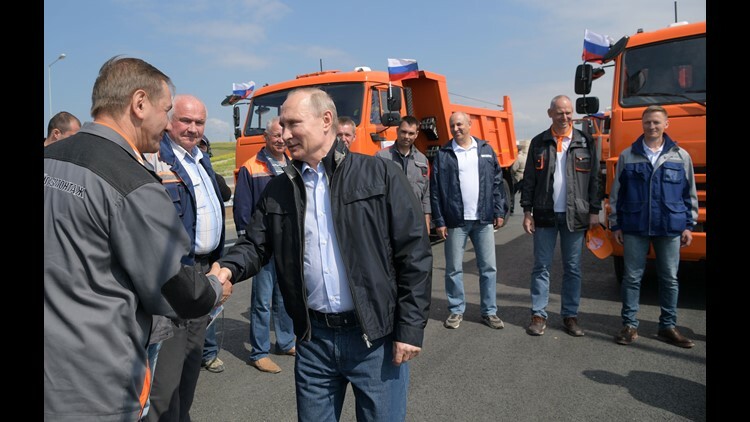 Russian President Vladimir Putin meets with workers during an opening ceremony of the road section of the Krymsky (Crimean) Bridge over the Kerch Strait, Crimea, May 15, 2018. Russian President Vladimir Putin (L) welcomes Chinese President Xi Jinping (R) during their meeting in the Kremlin in Moscow, Russia on July 4, 2017. Russian President Vladimir Putin attends a wreath-laying ceremony at the Tomb of the Unknown Soldier in Alexandrovsky Garden near the Kremlin wall in Moscow, on June 22, 2017, to commemorate those who lost their lives defending the Soviet Union against Nazi invaders. Russian President Vladimir Putin talks to press after his annual televised call-in show in Moscow on June 15, 2017. Putin said during Thursday's live call-in show televised nationwide that the 'crisis is over,' pointing at economic growth over the past nine months. Russian President Vladimir Putin, center, attends the State Prize awards ceremony marking the 'Day of Russia' at the Grand Kremlin Palace in Moscow on June 12, 2017. Ten people were awarded for their significant contribution to the science and technology, literature and art fields. French President Emmanuel Macron, right, and Russian President Vladimir Putin walk in the Galerie des Batailles (Gallery of Battles) at the Versailles Palace as they arrive for a joint press conference following their meeting in Versailles, near Paris, France on May 29, 2017. Monday's meeting comes in the wake of the Group of Seven's summit over the weekend where relations with Russia were part of the agenda, making Macron the first Western leader to speak to Putin after the talks. Russian President Vladimir Putin takes part in the 'Night League' teams ice hockey Gala match in Sochi on May 10, 2017. Russian President Vladimir Putin delivers his speech during a military parade in Moscow, Russia on May 9 2017. Russia celebrates the 72nd anniversary of the victory over the Nazi Germany in World War II on May 9, 2017. Russian President Vladimir Putin visits an ice cavern on Alexandra Land Island in the remote Arctic islands of Franz Josef Land on March 29, 2017. Russian President Vladimir Putin, left, holds a sword while listening to the head of Russian First Channel Konstantin Ernst, during his meeting with the crew of the historical action film "Viking", in Moscow, Russia, Dec. 30, 2016. The "Viking" movie is an historical action film based on the historical document Primary Chronicle and the Icelandic Kings' sagas. Russian President Vladimir Putin, left, and Indian Prime Minister Narendra Modi walk during their meeting at Taj Exotica hotel in Goa on October 15, 2016. Indian Prime Minister Narendra Modi and Russian President Vladimir Putin signed lucrative defense and energy pacts on October 15 following talks aimed at reinvigorating ties between the former Cold-War allies. Goa is hosting the 8th annual BRICS summit (Brazil, Russia, India, China and South Africa) on October 15 and 16, 2016. Russian President Vladimir Putin takes part in the Business Russia Congress in Moscow on October 18, 2016. The event is organized by the All-Russian public organization Delovaya Rossiya. Russia's President Vladimir Putin waits for other leaders to take their spots for the traditional "family photo" on the final day of the Asia-Pacific Economic Cooperation (APEC) Summit at the Lima Convention Centre in Lima on November 20, 2016. Asia-Pacific leaders are expected to send a strong message in defense of free trade as they wrap up a summit that has been overshadowed by US President-elect Donald Trump's protectionism. Russian President Vladimir Putin speaks with young boys, five-year-old Timofei Tsoi, right, and nine-year-old Miroslav Oskirko during the Russian Geographical Society awards ceremony in Moscow on November 24, 2016. Russian President Vladimir Putin plays with an official match ball for the 2017 FIFA Confederations Cup, named "Krasava", after a meeting with FIFA president on November 25, 2016 at the Kremlin in Moscow. Russian President Vladimir Putin walks along a department of tube-rolling mill in Chelyabinsk on December 5, 2016, during his working visit to the region. Russian President Vladimir Putin, left, listens to Rosneft CEO Igor Sechin during a meeting on December 7, 2016 at the Kremlin in Moscow. Russian President Vladimir Putin pays his respects to slain Russian Ambassador to Turkey Andrei Karlov, during the funeral ceremony at the Russian Foreign Ministry in Moscow on December 22, 2016. Russian President Vladimir Putin on December 22 bade farewell to Andrei Karlov at a packed memorial ceremony in Moscow for the diplomat who was assassinated in Turkey by an off-duty policeman. Russian President Vladimir Putin speaks with Defense Minister Sergei Shoigu, right, and Foreign Minister Sergei Lavrov during their meeting at the Kremlin in Moscow on December 29, 2016. Putin said on December 29, 2016 in televised comments that Damascus and the bulk of the armed opposition had signed a document on a ceasefire in Syria and also an announcement on their readiness to start peace negotiations. The truce deal will go into effect from midnight, Russia's Defense Minister Sergei Shoigu said, with the Syrian military announcing that it was gearing up to halt all operations. Russian President Vladimir Putin, right, and Japanese Prime Minister Shinzo Abe, left, share a light moment during their visit to the Kodokan judo hall in Tokyo, Japan on Dec. 16, 2016. Russia and Japan agreed Friday to hold talks on joint economic development on four islands at the center of a territorial dispute between the countries. Putin is well-known for practicing judo. Russian President Vladimir Putin, right, and Prime Minister Dmitry Medvedev walk after president's state-of-the-nation address in the Kremlin in Moscow, Russia on Dec. 1, 2016. In a conciliatory state-of-the-nation address, President Vladimir Putin on Thursday voiced hope for mending a rift with the U.S. and pooling efforts in fighting terrorism. Russian President Vladimir Putin enters a hall to attend a session of the Council for Civil Society and Human Rights in the Kremlin in Moscow, Russia on Dec. 8, 2016. Russian President Vladimir Putin, left, speaks with U.S. President Barack Obama in Hangzhou in eastern China's Zhejiang province on Sept. 5, 2016. Left to right, Armenian President Serzh Sargsyan, Kazakhstan's President and Supreme Eurasian Economic Council Chairman Nursultan Nazarbayev, Russian President Vladimir Putin, Kyrgyzstan's President Almazbek Atambayev and Eurasian Economic Commission Board Chairman Tigran Sarkisyan pose for a picture prior to the Supreme Eurasian Economic Council meeting in St. Petersburg, Russia on December 26, 2016. The Eurasian Economic Union is an international organization of regional economic integration. Russian President Vladimir Putin speaks during the All-Russia People's Front forum in Moscow, Russia on November 22, 2016. Russian President Vladimir Putin created the All-Russia People's Front in 2011, it brings together nongovernmental organizations, youth groups, and business associations along with the ruling party. Russian President Vladimir Putin meets with Russian and foreign cultural figures, that are implementing joint projects, in the Mariinsky Theater during his visit in St. Petersburg, Russia on December 2, 2016. Journalists try to attract Russian President Vladimir Putin's attention to their question during Putin's annual press conference in International Trade Center in Moscow, Russia on December 23, 2016. A total of 1,437 journalist from all regions of Russia are accredited at the press conference with many of them using various creative ways to attract the attention of the Russian leader and to ask their questions. Russian President Vladimir Putin speaks during the commissioning of the YaMZ-530 gas engines serial production at Avtodizel, PJSC in Yaroslavl, Russia on November 12, 2016. Russian President Vladimir Putin attends a meeting with with Russian business community representatives in the Kremlin in Moscow, Russia on December 19, 2016. Russian President Vladimir Putin holds a glass during a ceremony of receiving diplomatic credentials from foreign ambassadors at the Kremlin in Moscow, Russia on November 9, 2016. Russian President Vladimir Putin plays with his dog Yume before being interviewed by Nippon Television Network Corporation and Yomiuri Shimbun newspaper ahead of his official visit to Japan in the Kremlin in Moscow, Russia on December 7, 2016. Russian President Vladimir Putin meets with Leonid Mikhelson, Chairman of Management Board - Director of NOVATEK Russians independent natural gas producer, at the Novo-Ogaryovo residence outside Moscow, Russia on November 14, 2016. Russian President Vladimir Putin shakes hands with US actor Steven Seagal at the Kremlin in Moscow, Russia on November 25, 2016. The Russian President handed a Russian passport to Seagal and congratulated him on receiving Russian citizenship. Russian President Vladimir Putin attends the Primakov Readings International Forum in Moscow, Russia on November 30, 2016. Russian President Vladimir Putin holds a meeting with Government members in the Kremlin in Moscow, Russia on November 23, 2016. Russian President Vladimir Putin visits the Przewalski's horse re-introduction center at the Orenburg Nature Reserve, Russia on October 3, 2016. Vladimir Putin is on a working trip to Orenburg region. Russian President Vladimir Putin meets with members of the WorldSkills Russian national team in the Kremlin in Moscow, Russia on December 9, 2016. Russian President Vladimir Putin and Prime Minister Dmitry Medvedev attend an unveiling of a monument to St. Prince Vladimir in front of Kremlin in Moscow, Russia, 04 November 2016. The Russian President inaugurated a monument to Vladimir the Great, a Slavic prince who Christianized large swathes of what is now Russia and Ukraine over a thousand years ago. The statue of St. Vladimir holding a cross, which stands at 58 feet tall, became a center of controversy last year when authorities announced it would be installed on the Moscow State University's campus. Russian President Vladimir Putin walks with German Chancellor Angela Merkel upon his arrival to discuss the Ukrainian peace process at the Chancellery on October 19, 2016 in Berlin, Germany. The leaders of Russia, Ukraine, France and Germany, known as the Normandy Four, are meeting to discuss implementation of the peace plan known as the Minsk Protocol, a roadmap for resolving the conflict in Ukraine after Russian forces invaded in 2014 and annexed the peninsula of Crimea. The United States has threatened renewed sanctions on Russia if the country did not either implement the plan in the coming months or arrive at a plan on how to do so. Russian President Vladimir Putin attends a meeting to discuss the Ukrainian peace process at the German federal Chancellery on October 19, 2016 in Berlin, Germany. The leaders of Russia, Ukraine, France and Germany, known as the Normandy Four, met in Berlin to discuss implementation of the peace plan known as the Minsk Protocol, a roadmap for resolving the conflict in Ukraine after Russian forces invaded in 2014 and annexed the peninsula of Crimea. The United States has threatened renewed sanctions on Russia if the country did not either implement the plan in the coming months or arrive at a plan on how to do so. Russian President Vladimir Putin poses for a photo as he attends festivities opening the Day of the City in Red Square in Moscow Sept. 10, 2016. Russian President Vladimir Putin speaks with workers during a visit to the construction site of a transport overpass over the Kerch Strait from the Russian Krasnodar region coast to Crimea, in Kerch, Crimea Sept 15, 2016. Russian President Vladimir Putin and Prime Minister Dmitry Medvedev watch fishermen's work as they visit the Lipno Island at the Ilmen lake in Novgorod region, Russia Sept. 10, 2016. Russian President Vladimir Putin and Prime Minister Dmitry Medvedev drink tea as they visit the Lipno Island at the Ilmen lake in Novgorod region, Russia Sept. 10, 2016. Russian President Vladimir Putin attends a Commonwealth of Independent States leaders summit at the Ala-Archa state residence in Bishkek Kyrgyzstan, Sept. 16, 2016. A street vendor waits for customers while sitting next to a portrait of Russia's president Vladimir Putin at a kiosk in central Moscow Sept. 14, 2016. Russia's President Vladimir Putin addresses a joint session of Russian parliament on Crimea in the Kremlin in Moscow on March 18. Putin pushed today every emotional button of the collective Russian psyche as he justified the incorporation of Crimea. Russian President Vladimir Putin watches downhill ski competition of the 2014 Winter Paralympics on March 8 in Roza Khutor mountain district of Sochi, Russia. Russian President Vladimir Putin performs a 'toast' prior to the Opening Ceremony of the Sochi 2014 Paralympic Winter Games on March 7 in Sochi, Russia. A woman watches TV showing Putin speaking about the situation in Ukraine in Moscow, Russia, on March 4. Vladimir Putin met with journalists at his residence outside Moscow to explain his position on the Ukrainian events, saying that he sees no need to send Russian troops to Ukraine now. Putin, center, shakes hands with the commander of the Western Military District Anatoly Sidorov, right, upon his arrival to watch military exercises near St. Petersburg, Russia, on March 3. Putin, center, and Defense Minister Sergei Shoigu, left, and the commander of the Western Military District Anatoly Sidorov, right, walk upon arrival to watch military exercise near St.Petersburg, Russia, on March 3. Putin listens to Fyodor Andreyev, president of the Alrosa diamond mining company, in the presidential residence outside Moscow on Feb. 26. Putin on Wednesday ordered exercises involving most of its military units in western Russia amid tensions in Ukraine. Putin, right, speaks with Deputy Prime Minister Dmitry Kozak after a meeting with Russian athletes, winners of the Sochi 2014 Winter Olympics, in Sochi, on February 24.
International Olympic Committee President Thomas Bach, left, and Putin look on during the 2014 Sochi Winter Olympics closing ceremony on February 23 in Sochi, Russia. Putin attends celebrations of the Day of the Fatherland Defender at the Tomb of the Unkown Soldier in Moscow, Russia, on Feb. 23, 2014. Putin attends a wreath laying ceremony at the Tomb of the Unknown Soldier by the Kremlin wall to mark the Defenders of the Fatherland Day holiday in Moscow on February 23. Putin, center, chairs a security council meeting in the Novo-Ogaryovo residence outside Moscow, Russia, on Feb. 21. The meeting focused on the situation in Ukraine. Putin shows handmade mittens presented to him at Canada House during the 2014 Winter Olympics on Feb. 14 in Sochi, Russia. Putin bangs on a drum after the team ice dance free dance during the 2014 Olympic Winter Games at Iceberg Skating Palace. Putin presents his dog 'Yume' to Japanese Prime Minister Shinzo Abe at the Bocharov Ruchei residence in Sochi, on February 8. Putin, left, looks at a snow leopard cub while visiting the snow leopard sanctuary in the Russian Black Sea resort of Sochi on Feb. 4.